The National Youth Development Agency recently moved to their new office space in 54 Maxell Drive, Corporate Park North in Woodmead, Gauteng. 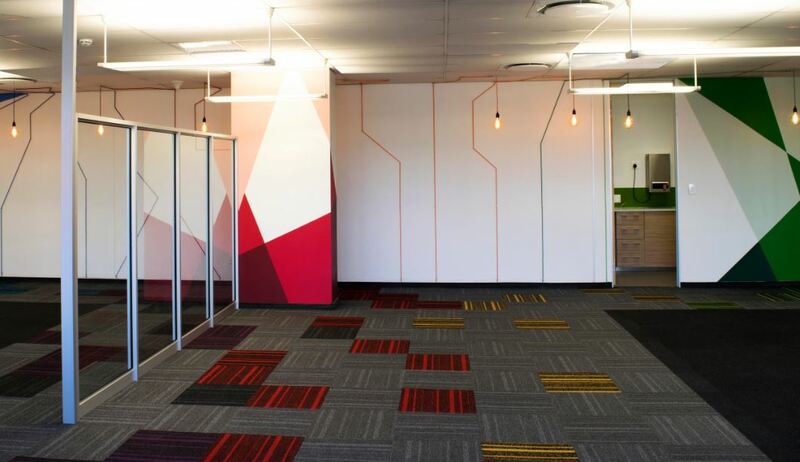 Inkhazi Pty Ltd was tasked with creating an interior space that would speak to the government agency’s goals of uplifting, supporting and empowering the youth of South Africa. Inkhazi’s main service is corporate interior design and they pride themselves on attention to detail, quick turnaround times and great interpersonal relationships with clients. Inkhazi means “creative spirit” in Swahili and they were able to truly live out this ethos with the National Youth Development Agency fit-out. Evette Annandale from Inkhazi explains that their brief was to create a youthful, enthusiastic, bold and colourful interior that would excite and inspire people who visited the building. Inkhazi worked closely with the marketing team at the National Youth Development Agency to make sure each and every detail contributed to their goal of inspiring and exciting the youth. Some of the training rooms, for example, have motivational quotes on the walls. The flooring is also multi-coloured, adding a unique energy to the space. “The National Youth Development Agency was a great client to work with and we took a lot of time to really understand their needs and conceptualise an inspiring interior for their new offices. They had the vision of creating a space that would empower the youth and we were able to meet this brief, thanks to products that we were able to source locally,” says Evette. Evette and her team at Inkhazi were tasked with not only creating a vibrant and creative space, but also to reuse as much as possible of the National Youth Development Agency’s existing furniture and interiors. Over 500 square metres of new flooring, however, was specified to make sure that the agency was able to make the bold statement that it set out to achieve. The interior design team needed a flooring solution that could handle a lot of foot traffic and be able to reflect the five different colours that form part of the National Youth Development Agency’s logo. “All of the new flooring that we specified was from Belgotex. The majority of the flooring was 500cm x 500cm carpet tiles from the Crossfire range. This carpet is exceptionally hardwearing and is available in so many different colours that we were able to obtain the exact bright and bold colours that we needed. The National Youth Development Agency wanted their offices to make a big statement, as their previous office décor had been limited to white and grey palettes. The Crossfire range from Belgotex definitely helped us to achieve this goal,” says Evette. Evette declares that she continues to specify Belgotex products for many of the projects that she works on because of their quality, their sustainability features, the reliability of the team and the customer service that the company offers. “In the 10 years that I’ve been an interior designer in the industry, I’ve installed Belgotex flooring products in 99% of the spaces that I’ve worked on. This is a testament to how much I believe in their products and I’ve never had a complaint from a client,” says Evette. “For companies that are focusing on green building, Belgotex also offers a magnificent range of products that have been manufactured using recycled materials. The company is up to date with technology and they always go the extra mile to make sure I know exactly how the product is manufactured. As a designer, this gives me a better understanding of the product that I’m putting down in a client’s space. I can rest assured that it is made from quality materials and that it has value, because their products are much more than simply pretty,” says Evette. Besides the Crossfire range, Evette often specifies Berber Point carpets from Belgotex as well as Luxury Vinyl Tiles such as the Davenport range. “My current favourite, however, is the Forces carpet range. Belgotex was very clever in how they constructed the carpet as it assists in acoustic treatments. It is very thick and has an eco-backing that is soft to walk on. For big corporates who are looking for that elegant feeling in a boardroom or have big, open spaces that are prone to echoes, the Forces carpet range is ideal,” concludes Evette.